Herb Steiner needs no introduction to Texan steel players. His live performances with the Cornell Hurd Band, Johnny Bush and at the Texas Steel Guitar Jamboree have endeared him to lovers of traditional steel guitar music. His instrumental albums, featured elsewhere in this catalog, are as much a testament to the purity of his musical vision as to his playing ability. Herb started his musical career in Southern California as the steel guitarist with Linda Ronstadt's Stone Poneys. He moved to Austin in 1972, where he has since graced the stage with such notable artists as Jerry Jeff Walker, BW Stevenson, Alvin Crow (Herb wrote Crow's hit Nyquil Blues), Wayne Hancock, and traditional country singer James Hand. 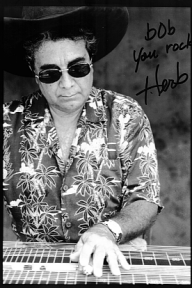 Herb was voted Steel Guitarist of the Year in 1996 by the Texas Steel Guitar Association, and in 2003 he was inducted into the Western Swing Hall of Fame in Sacramento, California. In recent years Herb Steiner has, as a musicologist, been documenting classic arrangements that feature the steel guitar. The result has been a series of instructional materials and rhythm tracks intended for home study. I'm very proud to be able to offer these items to you in this Steel Guitar Forum catalog. His charts are among the most readable I've found anywhere, and his knowledge of steel guitar topics is truly amazing. You won't be disappointed with any of the material presented on this page.